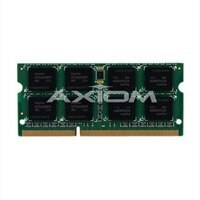 Axiom - Memory - 4 GB – SO DIMM 204-pin – DDR3 – 1333 MHz / PC3-10600Maximize your system performance with the 4 GB PC3-10600 204-pin SO DIMM DDR3 Memory Module from Axiom Memory. It includes top grade chips and components with fully tested, and guarantees with various systems. Also, it enhances the performance of your system and allowing you to work fast. Plug-in this 4 GB Memory Module and you will notice that everything starts working smoothly. Maximize your system performance with the 4 GB PC3-10600 204-pin SO DIMM DDR3 Memory Module from Axiom Memory. It includes top grade chips and components with fully tested, and guarantees with various systems. Also, it enhances the performance of your system and allowing you to work fast. Plug-in this 4 GB Memory Module and you will notice that everything starts working smoothly.